Reiki is a complementary procedure which helps to calm an animal, and relax an animal when he/she is stressed or has emotional or physical problems or is ill. The natural intrinsic healing processes within an animal are better able to function in an animal which is more calm and relaxed and peaceful and less stressed. Reiki is complementary to treatment by a veterinary surgeon. Reiki is never a substitute for professional veterinary care and treatment. 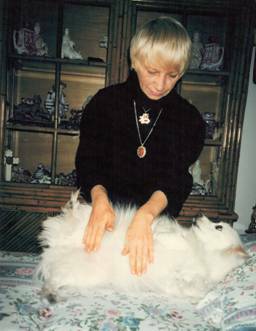 Reiki is a hands-on procedure, carried out in a relaxed and calm manner to help the animal feel calmer and less stressed. Each animal is an individual. Usually the animal will lay there peacefully through the session, and is relaxed, happy and contented. Animals can suffer from many ailments, some curable and some not, some mild and some severe. Pet owners should always obtain professional examination, diagnosis and treatment by their veterinary surgeon. When an animal is more peaceful and calm through a Reiki session and beyond, then the natural internal healing processes can function better complementary to veterinary care. Reiki does not cure the incurable, but animals with serious illnesses can be less stressed and more relaxed so that they can be happier. Reiki can also help to calm an animal when the owner is giving medicines, relax when stressed, and soothe when under veterinary care. Reiki is a form of laying on the hands. Reiki help to balance “chakras” within the animal body. But, what are chakras and how do they exert their influence? Chakras are energy centers located in a relatively straight line along the animal body. The word “chakra” means “wheel” and are seen as spinning wheels of energy. Chakras influence, both emotionally and physically, every part and function of the animal. Chakras vary in brightness, depth and size depending upon health and vitality. Each chakra governs a gland in the physical body, controls specific physical organs as well as all aspects of consciousness. Although the animal body contains a number of energy points, there are seven main Chakra centers in the animal aura. Through the seven chakras, animals receive and give off essential energy between the physical and subtle bodies. An animal’s thoughts and feelings filter down through the chakras to the physical animal body, where they become outer manifestations. A balance within the chakras results in optimal health and vitality. It is through the chakra network that the animal mind, body, and spirit interacts as one holistic system. Damage to one of the chakras through trauma, injury, emotional conflict, or other means, manifests as dysfunction in the related area of the physical animal body. Thus, diseases are caused. The purpose of using Reiki to restore the balance of subtle energies and return the physical animal being to a healthy state.